Buffalo is off to their first 4-0 start in the program’s FBS history. Going back to last season, the Bulls are now on a 7-game winning streak, tying the program’s FBS record set by the 2013-14 team (with Khalil Mack). The Bulls are also 8-point favorites and have a 59.8% chance of winning according to EPSN. This is about as outrageous as the price of your Long-O from Cadet Issue. Does anyone remember last week? Yeah, we almost beat #5 Oklahoma…oh wait I forgot that hardly anyone saw the game on $54.99 PPV (still waiting on the fine check from the OU Athletic Department). Just know that you heard it here first. Buffalo is not worth the hype. Yes they are 4-0, but their opponents combined record is 5-10. 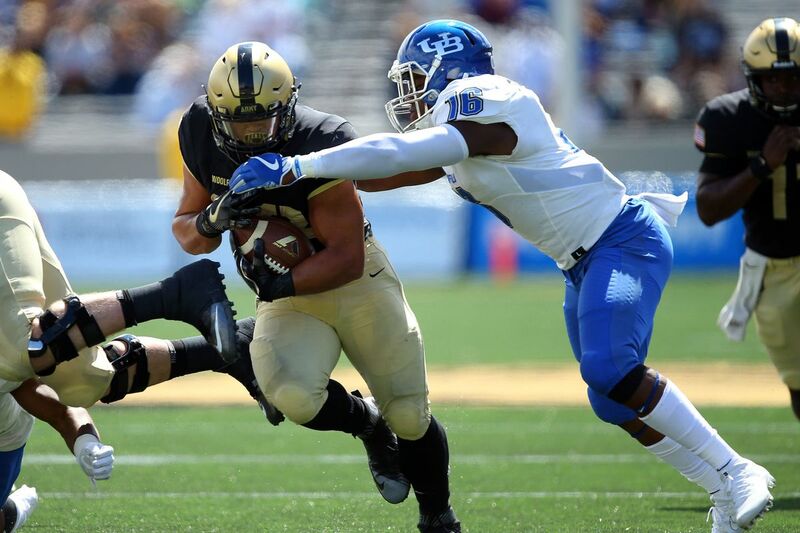 Army’s opponents on the other hand are 12-3. The Black Knights have had the 28th hardest schedule in the country so far this year, compared to the Bulls dismal 93rd ranked schedule. This will mark the third week in a row that the Black Knights face an opponent that is averaging over 40 points/game. 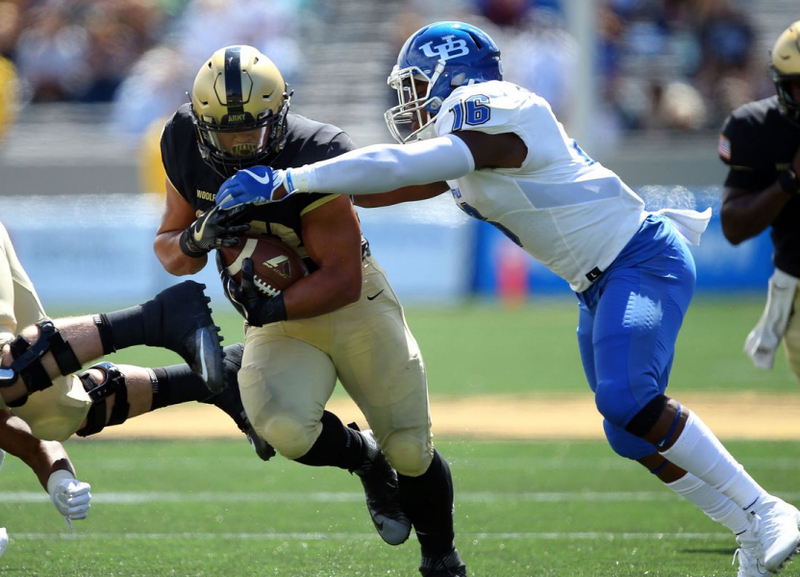 Buffalo is receiving votes in both the AP Top 25 and Coaches Polls (Army received votes in the Coaches) and is expecting the largest crowd at UB Stadium in recent history. Below are the keys to victory and why each team will win. Commit Only 1 Turnover – This team is no Oklahoma, so there is some margin for error. Remember that we will be on the road, in a hostile environment, with a team that thinks they are really good. We are 9-9 under Monken when committing 1 turnover, so let’s not make things harder on ourselves than they should be. Never trail by more than 10 – Subtract about 40,000 fans from last week and that will be the environment that you find yourself in late in this game. In order to take the crowd and home field advantage away from Buffalo, the Black Knights need to trail for as little time as possible. 3rd and 3 when you’re up by 14 sounds a lot different than 3rd and 3 when your trying to tie the game. Outgain the Bulls in Total Yards – We have only won 4 of the last 21 games when opponents outgain us. To unrefined fans, the triple option becomes more like watching a lava lamp. They don’t know what they are looking at, but they can’t look away. Simple, complex, which one is it…wow, would you look at that, the game’s already over. Keep Buffalo below 225 yards passing/125 yards rushing – Slowing down 6’7″ Tyree Jackson and his electric receivers will make the path to victory as clear as Flirty Walk. Although coaches like to say they are no moral victory’s, there most definitely are. Our loss to Oklahoma last week proved that we can play against the very best in the nation. Every game so far this season we have played an undefeated opponent. Our defense is ranked #14 in yards allowed/game and #23 in points allowed/game against AP Ranked teams. To make matters more convincing, Buffalo is ranked #128 in Red Zone efficiency and will be facing off against the #17 Red Zone defense against AP Ranked teams. Like any good [West Point Ref], the Cadet defense will bend but not break. Out of the Bulls 20 trips inside the Red Zone, they have only managed to come away with points 13 times. Oddly enough, it’s not due to missed field goals. They have had 4 turnover of downs, 2 interceptions, and 1 fumble. Their kicker, Adam Mitcheson, hit his only attempt this season from 46 yards against Temple. He has played all four years and has a career average of 64%. He isn’t the greatest kicker in college football, but never forget #Buffalo2016 when he kicked a 33 yard game winner in overtime to beat us. The Black Knights defense, led by James Nachtigal, welcomes Buffalo Red Zone aggression. Have I even mentioned our offense? Well they are ranked nationally in the following categories: #1 in Time of Possession, #15 in 3rd Down Conversions, and #7 in 4th Down Conversions. They won’t…If you are smart you will pick Army straight at near 3-to-1 odds. Tyree Jackson is not Kyler Murray. Going against our offense is like playing the “Older Kids” in a game of keep away. Buffalo will hardly have the ball and when they do, they will come to understand the meaning of Relentless Effort.